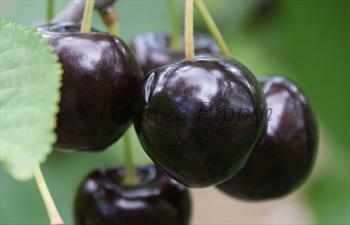 Kordia cherries are also resistant to the splitting caused by summer rain. If you want a cherry that is very big, and really black, this is the one to choose! Please fill in the details below and we will let you know when Kordia cherry trees are back in stock. Makes a good partner for Kordia if you like black cherries. A self-fertile variety and a good pollinator for Kordia. Kordia is in flowering group 4. Kordia is self-sterile and needs to be pollinated by another tree of a different variety nearby. Kordia is not self-fertile and therefore needs a pollination partner. Any self-fertile cherry variety will be suitable, particularly Stella and Sweetheart. You can also use Penny (another black cherry) or Regina. Kordia blossoms quite late but the blossom is not particularly frost-resistant, and it is best grown in a sheltered area, or at the top of a slope where frost can drain away downwards. It has a fairly low-chill requirement of 700-750 hours, making it a useful variety for warmer climates. Kordia is a chance seedling of unknown parentage, found near Techlovice in the Czech Republic in the 1960s. It is also known as Attika and Techlovika II.